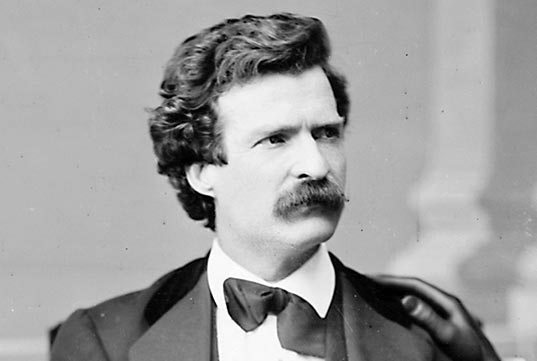 Mark Twain (1835-1910) is America’s most distinguished author in my mind. William Faulkner called Twain “the father of American literature” and I can understand why. His thoughts and observations about American society in his essays is always honest and straightforward. The Adventures of Huckleberry Finn is still on the mark that today, some 100 plus years after the Civil War.Mark Twain’s insights into the provincial mindset of some Southerners still rings true today, as can be seen in the mindset of the neoconservative movement. Although the racism is often disguised, it still shows itself on occasion, as in the recent case of the Jena Six. I read The Adventures of Tom Sawyer when I was in grade school and I thought is was funny and entertaining. But when I read Adventures of Huckleberry Finn in high school, I saw how Twain was talking about American racism in very real and stark terms. I really appreciated him for writing so openly about reality of life in America.